A watermans delight with immediate access to the Indian River Bay. 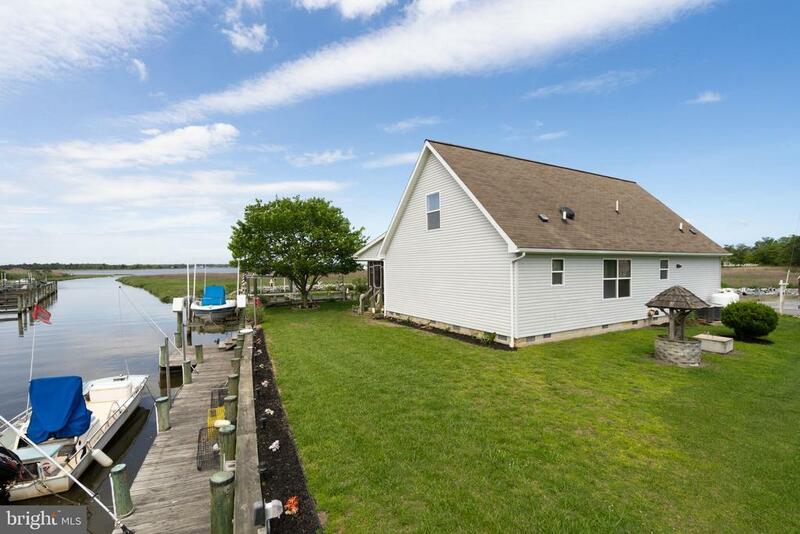 Absolutely lovely waterfront Cape Cod home; formal dining room, large living room, two entry level bedrooms including the master with jetted garden tub and both have full en-suites, the second master suite bath has 5 shower with seat. Full eat-in kitchen with all GE and Bosch appliances, main floor laundry. Upstairs are two additional bedrooms with bath and shower. The center of the upper level is a very large family gathering area with 6 closet, can be used as a 4th or 5th bedroom, office, game room, library, overflow guest gathering space, or whatever your imagination leads you to. There is a floored attic space with pull down stairs and the knee walls are well lit. Each room in this home is wired for cable, internet, and phone, and have ceiling fans. There is dual gas heating and air systems; the 1st floor has a 2.5 ton unit with an electric baseboard for a backup if needed, and the 2nd floor has a 2 ton unit. New neutral tone carpeting installed and freshly painted. Outside is a 10x48 Trex deck, screened and roofed porch. There are two electric boat lifts, one 10, 000 pounds, the other 4, 500 pounds with a 4 foot draw at mean low tide, and a 60 canal side dock. There is a yard irrigation system with 35 sprinkler heads and a terrific 10x18 Sunsetter awning. The views to Falling Point Cove, Pepper Creek, and the Indian River Bay are quite spectacular from your home and screened in porch. The crab shack is a great utility house for an office, hobby building or with modifications; an informal guest house. There is a master water conditioning system, a 1hp Gould water pump with a 1" supply line to the house and 3/4" supply to the dock, a 2800 gallon holding tank, numerous exterior electrical boxes and water spigots. At this price, it is worth your look! Low taxes, $900 a year, no city tax, low (voluntary) HOA $50 a year, no land lease, no condo fee, no boat docking fee. What could be better?